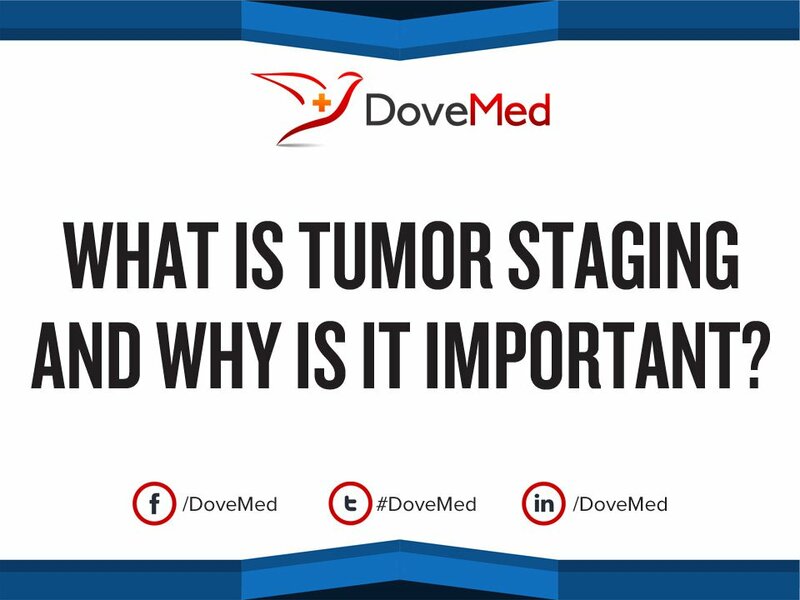 What is Tumor Staging and Why is it Important? The staging of a tumor is done based several characteristics of the tumor, such as its size, spread and cellular abnormalities within the tumor. The stage assigned at diagnosis is always used to refer to a cancer regardless of subsequent spreading or advancement of the tumor. In other words, over time, as new information gathered about the tumor and its progression is added to the original stage, the stage does not usually change. To determine the stage of a tumor, a healthcare provider may order lab tests, X-rays, or other procedures depending on each individual case. Cancer staging can be categorized into clinical stage and pathologic stages. The clinical staging is performed before the tumor is removed. The healthcare professional may use a variety of tools, such as blood test, imaging studies (such as Ultrasound scans, Computed Tomography or CT scans, Magnetic Resonance Imaging or MRI scans, Positron Emission Tomography or PET scans, and Bone scans) and physical examination. The pathologic staging is performed when the pathologist examines the tumor tissue after the surgery. In general, the pathologic stage is more accurate than clinical stage. However, since the two staging systems use different methods, they may differ frequently. In many cases, the information derived from the two staging methods complement each other. Sometimes, treatments such as radiation therapy or chemotherapy are initiated before surgery. This may result in “under-staging“ of the pathological staging, when subsequent surgery to remove the tumor is performed. On other occasions, a surgery may not be performed to remove the tumor. In such cases there is no pathological staging and the treatment is based solely on the clinical staging. The TNM system is the most common cancer staging system used by many hospitals and medical centers as their main method for cancer reporting. Their typical pathology reports will very likely use the TNM system for describing cancers. Staging systems other than TNM are used to describe tumors of the brain and spinal cord, as well as blood cancers. Stage 0 Abnormal cells are present, but have not spread to the nearby tissues. This is commonly referred to as carcinoma in situ or CIS, which is not cancer, but may develop into cancer later on. Stage I, Stage II, and Stage III Cancer is existent. The higher the stage, the larger the tumor is, and the more it has spread to nearby tissues. Stage IV The cancer is present in distant parts of the body in relation to the primary tumor. Edge, S. B., & Compton, C. C. (2010). The American Joint Committee on Cancer: the 7th edition of the AJCC cancer staging manual and the future of TNM. Annals of surgical oncology, 17(6), 1471-1474. Greene, F. L., & Sobin, L. H. (2009). A worldwide approach to the TNM staging system: collaborative efforts of the AJCC and UICC. Journal of surgical oncology, 99(5), 269-272. Ludwig, J. A., & Weinstein, J. N. (2005). Biomarkers in cancer staging, prognosis and treatment selection. Nature Reviews Cancer, 5(11), 845-856. Webber, C., Gospodarowicz, M., Sobin, L. H., Wittekind, C., Greene, F. L., Mason, M. D., ... & Groome, P. A. (2014). Improving the TNM classification: Findings from a 10‐year continuous literature review. International journal of cancer, 135(2), 371-378.